This morning I went to the flea market where on Wednesdays it is produce day. I bought some exotic vegetables that we Asians love like daun ubi (tapioca leaves). I bought some last week, but felt like more! I also bought some bananas for banana fritters, kangkong, some ginger and some ground nuts. I felt like eating some kacang rebus. When I left the house it was cool but usually it gets warmer later in the morning but this morning it was windy as well and so it remained cool. I didn't expect the cold so I wasn't wearing a sweater or a light jacket. I hurried with my shopping and drove home immediately. When I got home I went online for a while and then I started with the banana fritters. Mmmm, lovely! Been a while since I made banana fritters! Then I decided to set up the new computer that Doug bought me. I cleared some table space in my studio. I got everything working but when I tried installing the driver for my wireless adapter it refused to install. Arrrgggghhh! It was not compatible with Windows Vista! And then it was a hurried lunch. After that, I went back online and updated two other blogs that I have. Once I was done with that, I called up my Malaysian friend in Florida, who's also married to an ang moh, and chatted with her for a while. I have been encouraging her to start blogging. She works two days a week and the rest of the week she stays at home and does nothing in particular. She is visually impaired so she doesn't drive herself any where. Next, I started setting up the quilt that I promised a customer I'd finish in two weeks. Today is exactly two weeks since she dropped off her quilt and I'd only started with it! It's a hard quilt to work on because of all the appliqués on it. I had to think of how I was going to work around the appliqués. I prefer where all I need to do is quilt it edge to edge. Nothing to think about, just follow the pantograph pattern! I haven't progressed very far with the quilt. I did about a yard of it and decided I didn't like what I'd done, and so I started ripping off the stitches. And that is where it remains today. 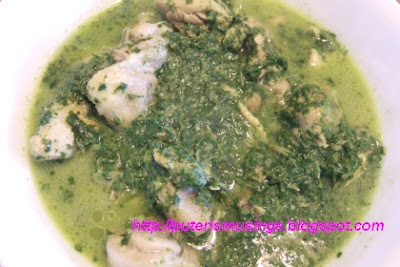 Chicken cooked with daun ubi and coconut milk. It's after dinner now. The kids are back in the house after playing outside in the cold. Now I am ready to put them in the tub and let them sit in there for a while. P.S. U.Lee, so now you know why you beat me to it with the new entry! Heheh. Wow...see the pictures, hungry already. House stink never mind, as long family enjoy the home cook meal...hehe i know i do. Good thing Doug doesn't complain how how stinky the house is! He loves the daun ubi .. only tried it for the first time last week! True about home cooking .. but chief cook needs some time off too, so it has become our family tradition to eat out on Friday nights. Haha, Mr Green, I wanted to use a Malay word, but somehow I thought "tutuk"is also the same word in Malay! Haha, it should be "tumbuk"! Hello Puteri, Wa...I must get down from my chair, stand up, face West (you in California, therefore West) raise my glass of ice coffee, Maxwell House, rich blend of course to you. A blogger salute to an expert, class blogger. Is it because you going in for US presidential elections? No! You can install, upgrade, do up all the hi-tech thingmagic with a new computer. Holy Smoke! And me my talents lie only with opening tin food. You know SUV, computers, Orchids, Skin care, facial beauty, crest toothpaste...and now a motivator to others to become bloggers, women like you, especially pretty ones sure don't grow on trees. 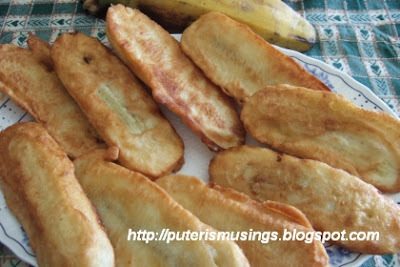 And your this goreng pisang and daun ubi kayu? I have not eaten second one since can't even remember when. Now I'm wondering what time is the next flight to California? Ha ha. No wonder I beat you to a new posting this time, ha ha. Okay, will give you a Tiger Woods handicap, I am resting now. I only do a post once every 4 days unless get inspirasi somewhere. I bet Doug must have been searching for a oxygen mask somewhere when you started cooking, huh? Arhaaa ha ha. Have a nice day, Puteri, Lee. Hi Puteri ... very constructive and fulfilling day for you, eh? U.Lee is right. You have many interests that you embrace with equal passion while taking care of a family as well, and yet have time for friends in need. :) BTW --I tried to visit your blog for the past two days but each time it asked for activation of some Window Player program "Active X".?? I daren't, didn't and your page comes up but empty of contents, just a grey background! Today, it happened again but the contents came up after a while. Phew! My end mystic or your new changgih PC?? Happy Quilting! Lee, you exaggerate! Haha, know sikit sikit only lah when hi tech stuff is concerned! If I messed it up, hubby is there to rescue me! What presidential elections? Haha, I'm just following the campaigns thru talk radio .. every now and then mumbling to myself, giving my 2cents to what I hear on the radio! Come lah, jump on the next plane to California, and I'll cook you all theMalaysian foods, only the ones I know how to cook lah! Heheh. No oxygen mask for Doug .. his sense of smell is not as good as mine .. moreover he never complains about any stinky food smell ..wah, this morning I woke up and the house still stinks of belacan goreng, and ikan masin goreng! Phewww! Need to light more scented candles! Today, busy quilting .. tomorrow going to visit in-laws who live about 6 hours away will be gone all weekend. Let you win the next round also, Lee! :-) Hahah. Rita, the new pc is still not connected to the internet. Still need to get a new USB wireless adapter for it, one that is compatible with Vista. I don't have anything that needs Active X on any of my blogs .. dunno why lah ... I had the Besame Mucho mp3 but that is like playing a youtube video .. nothing that needs any canggih application. See if it still happens next time and let me know. Hey, I enjoyed your petai posting! I really need to look for petai around here, all that sambal petai talk has whetted my appetite!